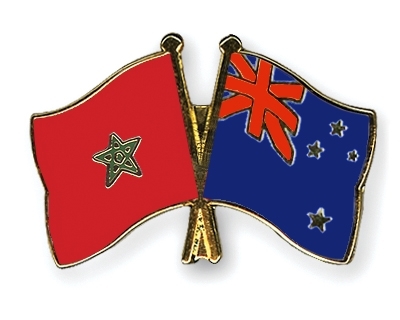 - September 1993 : Appointment of Mr. John Hayes as Honorary Consul of Morocco in Auckland. - 6 March 2007 : Presentation by HE Mr Badre Eddine Allali of his Letters of Credence as ambassador of His Majesty the King to New Zealand with residence in Canberra. - Visit of Mr Mustapha Mansouri, Minister of Employment and Vocational Training, in July 2005. Exports : NZ$144 Millions. Mainly phosphates. Imports : NZ$46 Millions. Mainly butter. - Framework agreement for cooperation in the sector of fisheries. - Draft convention for the avoidance of double taxation and the prevention of fiscal evasion. - Convention for partnership and exploratory research of deep waters between the "Institut National de Recherches Halieutiques'' and New Zealand company "Sealord".